Benchmarks have apparently leaked showing that the upcoming Qualcomm Snapdragon 850 chipset, which was announced at Computex 2018 earlier this year, will indeed offer a performance upgrade, but not a huge one. The current crop of Snapdragon 835-powered Windows 10 on ARM laptops, such as the HP Envy x2, received lukewarm reviews, mainly due to their underpowered performance. These devices are supposed to bridge the gap between smartphones and laptops, offering huge battery lives and always-on mobile internet connections. However, when running Windows 10 and more intensive apps, they struggle compared to laptops with Intel or AMD hardware. 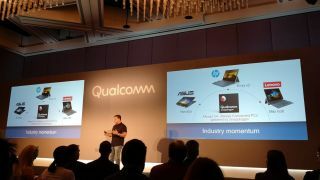 When Qualcomm promised that the Snapdragon 850 chipset would offer 30% improved performance, as well as 20% better battery life, many of us were hopeful that the next generation of Windows 10 on ARM devices would be much better. However, according to the leaked benchmarks, Snapdragon 850 may bring better performance, but not quite as much as Qualcomm had promised – or we had hoped. The benchmarks (which were originally spotted by German website WinFuture) appear to show an unannounced Lenovo device which is built on the Snapdragon 850 platform, against the Asus NovaGo, which runs on Snapdragon 835. While single-core performance seems to be improved, with the new device scoring 2,263 compared to the 1,802 points of the NovaGo (which is around a 25% improvement), the multi-core scores are underwhelming, with the new device scoring 6,947 to the older device’s 6,475. As Neowin, which covered this leak, points out, that’s a performance improvement of just 7.3%. So, although those increases are to be welcomed, if these benchmark results are legitimate it may mean that the upcoming generation of Snapdragon-powered laptops don’t represent the leap in power many of us hoped. Of course, before anyone gets too disappointed, it’s worth remembering that these are leaked, unverified benchmarks. When Snapdragon 850-powered laptops are released, and we get our hands on them, we’ll run in depth tests to see just what kind of performance improvements they deliver.